Happy Tuesday! I hope you all had a wonderful time celebrating the 4th of July! I'm kicking off my 4th of July recap with a little roundup of all the fun activities we did over the past week. 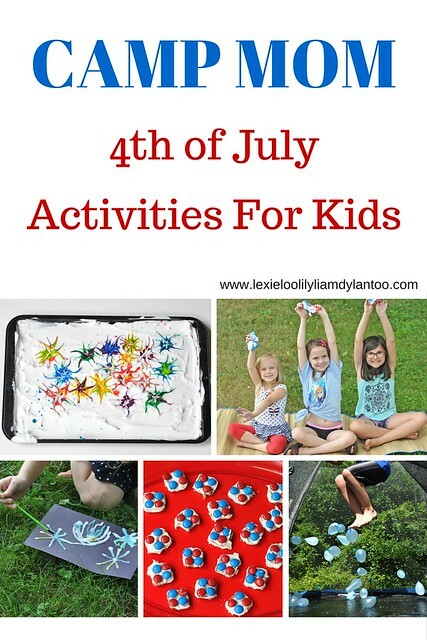 Although they are definitely activities inspired by the 4th of July, they can definitely be altered for everyday use! This activity is simple and fun! 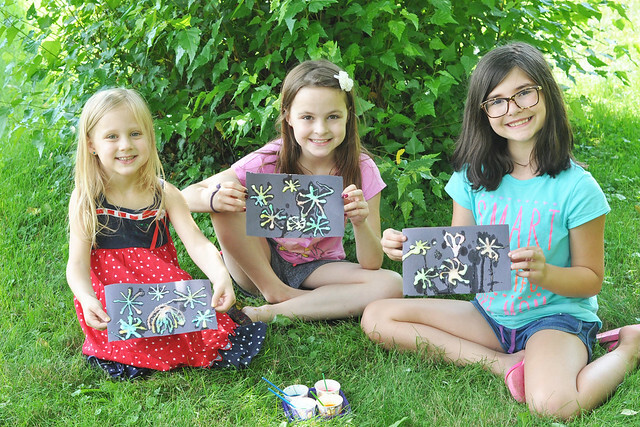 Make fireworks shapes on black construction paper using the white glue. 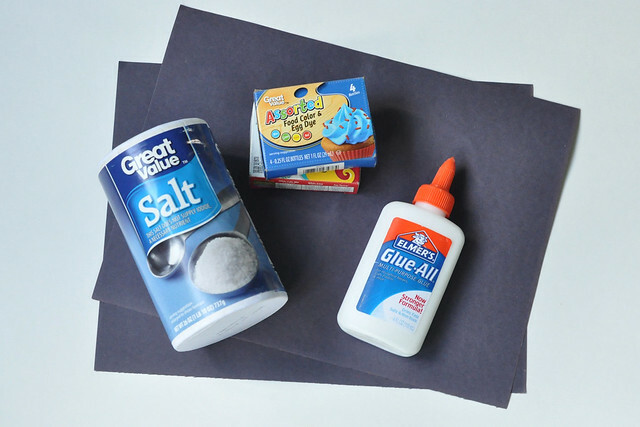 Sprinkle generously with salt until all the glue is covered, then gently shake the excess salt off the paper. They turn into a great keepsake! 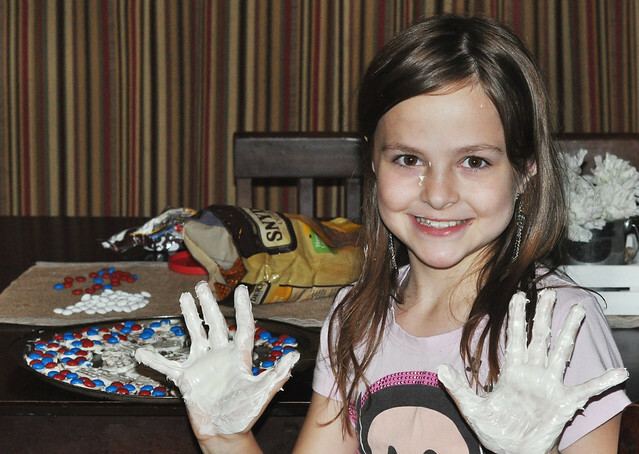 Making flubber is fun, but it's also a great science experiment! Empty bottle of glue into bowl. Mix in 1/4 cup warm water. Mix in drops of red food coloring and stir until you get the desired color. In a separate bowl mix 1/2 tsp of borax into 1/4 cup of warm water. Slowly pour borax mixture into glue mixture. The mixtures will immediately begin to bond together. Use your hands to knead the flubber until all the water is absorbed. This may take several minutes. 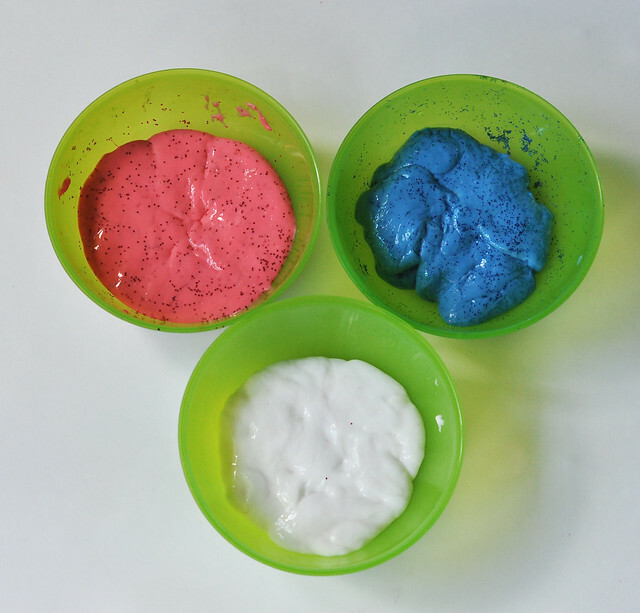 Sprinkle red glitter on top of the flubber and mix it in. Repeat steps 1-7 using blue food coloring and blue glitter. Make another batch without food coloring for the white flubber. 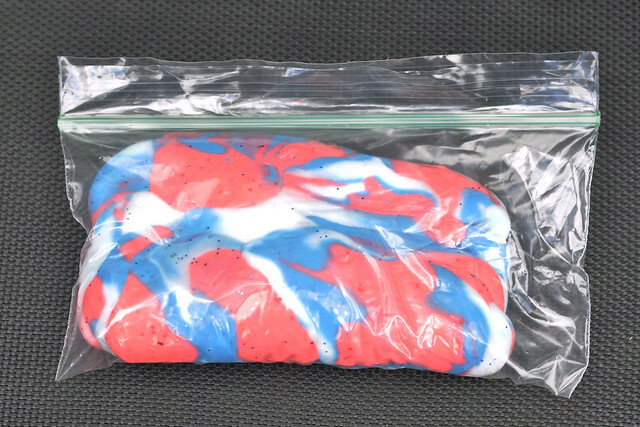 When the kids are done playing, they can store the flubber in a ziploc bag. Our flubber usually lasts a few weeks! This one is about as easy as it sounds! 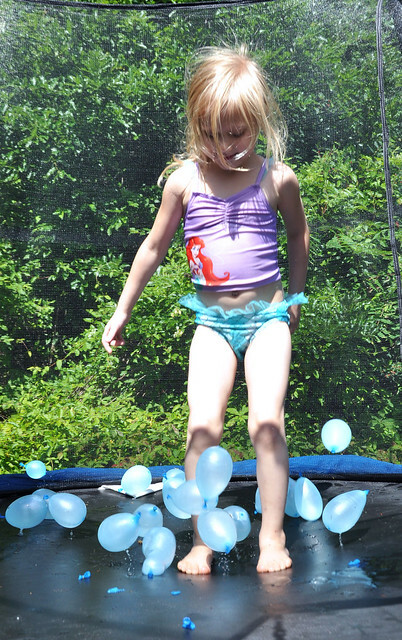 Fill 30-100 water balloons, toss them onto the trampoline and allow each child to jump for 30 seconds. Have the kids continue to take turns jumping until all the balloons are popped! No trampoline? No problem! Just toss them on the ground and have the kids jump on them! I highly recommend the Bunch-o-Balloons to make this job much easier! Lexie is very into baking these days, so I try to find simple recipes for her to make on her own. She told me about a pretzel bite recipe that she saw on a cooking show that used square pretzels, melted chocolate and M&M's. I came up with a good 4th of July-themed alternative for her! Spread a thin layer of vanilla frosting on each pretzel. 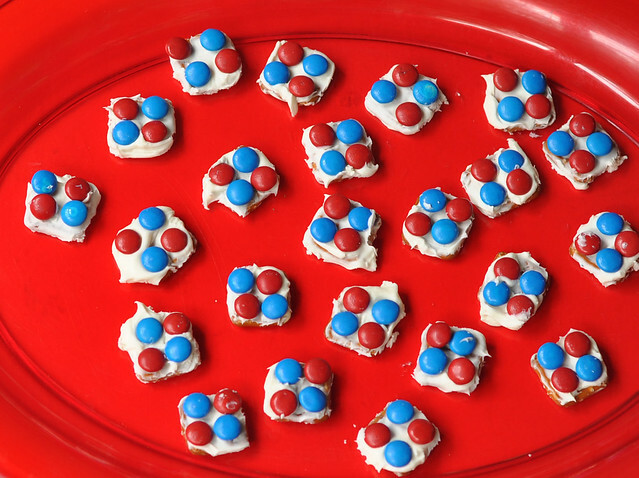 Decorate with red and blue M&M's. Cover and place in refrigerator for several hours until the frosting hardens. Lexie made these entirely by herself and everybody loved them! This activity was our favorite! 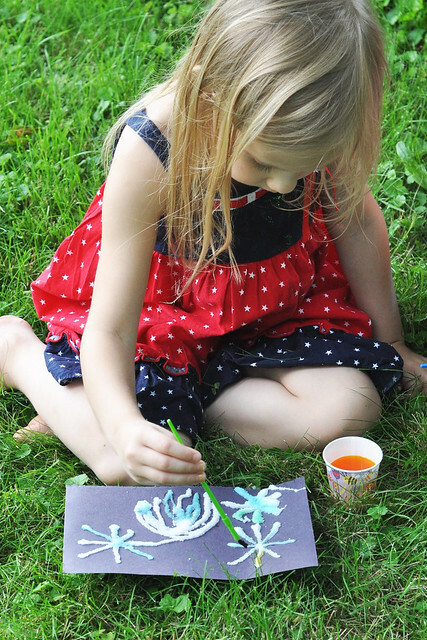 I first saw the idea on Pinterest and they just used red and blue paint, but Lily wanted to use a rainbow of colors. I also chose to use food coloring instead of watercolors. 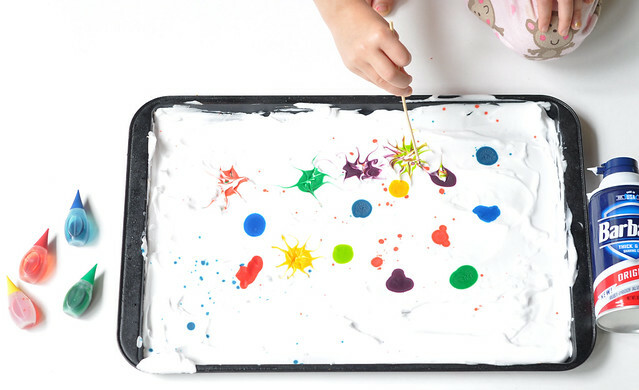 Squirt shaving cream onto cookie sheet and level it out using a spatula. You want to have a flat, smooth surface. 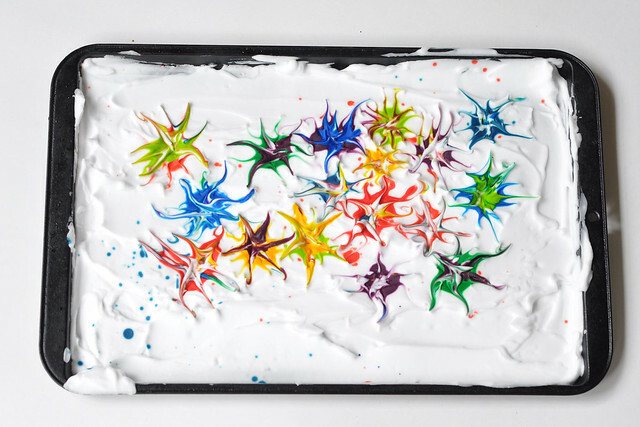 Squirt drops of food coloring onto the shaving cream. Using the toothpick, poke the center of a drop then gently drag outward so the color spreads outside of the drop. Continue around one drop until it looks like a firework. 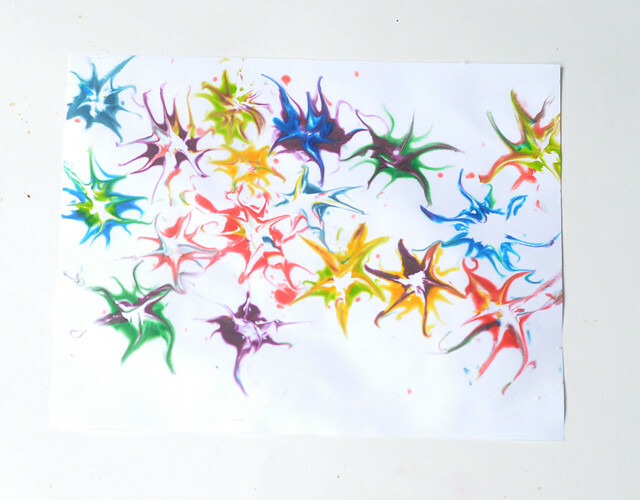 Repeat with each drop of color and don't be afraid to add additional drops onto of the fireworks and repeat the process for a fun effect! Once all the fireworks are complete, gently place a piece of white paper onto the shaving cream. 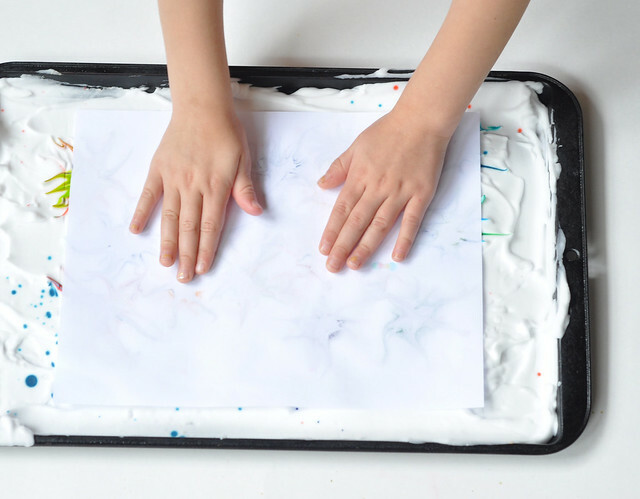 After a few seconds (you will begin to see the color "bleed" onto the paper), gently peel the paper away from the shaving cream and set aside to dry. You can make several prints from the same batch! 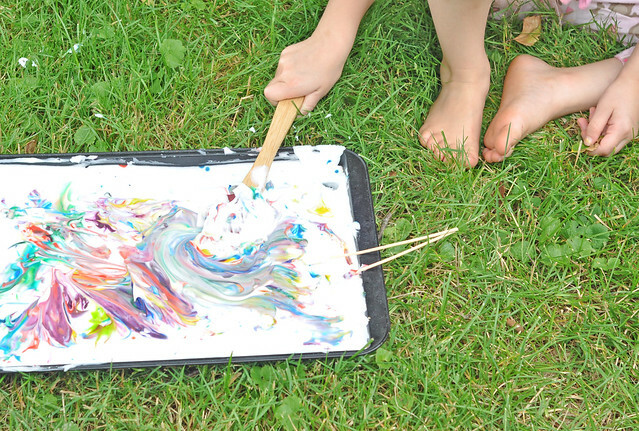 After Lily was done, I let her take the cookie sheet outside for some sensory play and color mixing! 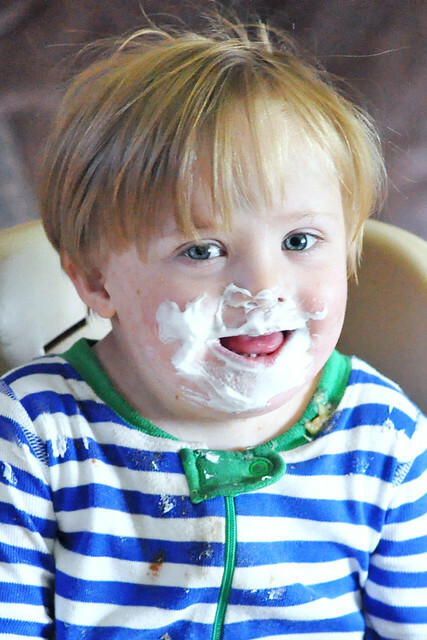 Meanwhile, Liam had some fun with his highchair tray full of shaving cream! This is definitely a project we will be repeating soon. Lexie was bummed that she missed this one and really wants to make one of her own! 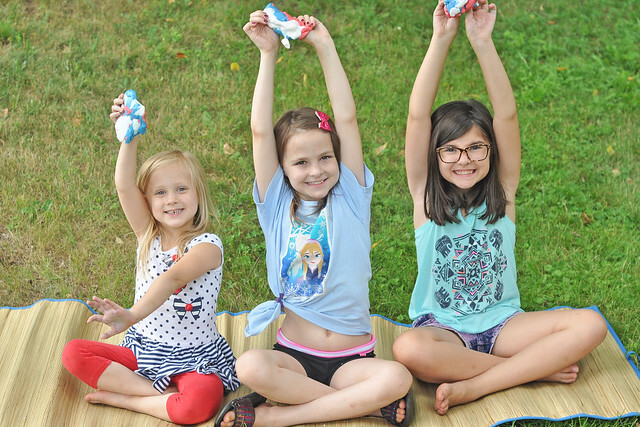 Stay tuned for a recap of our very rainy 4th of July and a week's worth of Star Spangled Kids style! What is your favorite 4th of July activity? What great ideas! 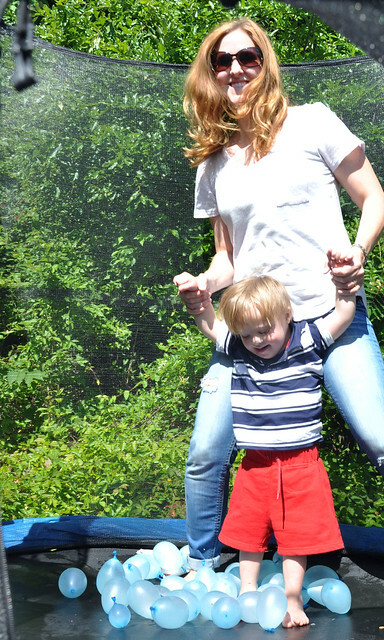 I love the water balloon bounce party--we have a trampoline, so I can't wait to try this. I also like your July Pretzel Bites--I just love the taste of chocolate and pretzels--YUM! It looks like you all had an awesome week planning for the 4th. Our highlight this weekend was visiting with family and going to see fireworks. So many fun ideas! Where do you get the energy for it all?!!! Thank you! I'm not quite sure! So, so fun! I love the flubber! Thanks! It's one of their favorite things to make! You are seriously the coolest mom friend. Your kids are so lucky to have you. Thank you so much! I love to see them doing things away from electronics, so I try to keep them occupied! Can we fly out for a week of camp mom? I love all of your activities! So much fun! 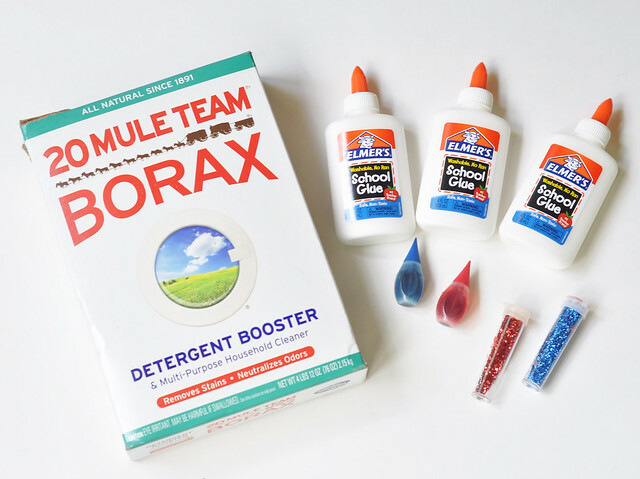 I bough borax once to use for slime but the recipe was a flop. Looks like yours was a success. YAY! Oh no! I've found a few pinterest ideas that were complete flops! 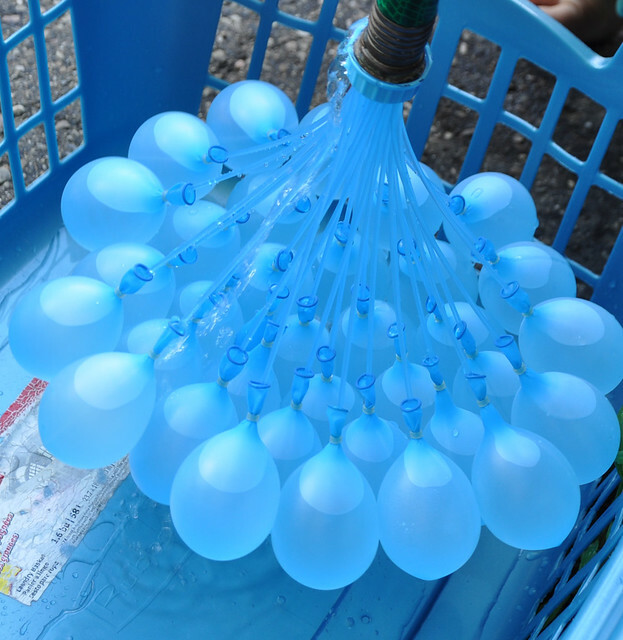 Those are some awesome crafts and what a cool way to fill up the water balloons all at once. Thank you! Somebody made a fortune on that water balloon idea. Genius! So fun! My kiddos love those water balloons!